Study in an accredited program that will prepare you for success in this growing field. If you have an interest in health care and computer technology and are looking for a people-oriented profession in an expanding job market, consider a career in nuclear medicine technology. The U.S. Department of Labor predicts that employment of nuclear medicine technologists will increase by 18 percent from 2010 to 2020. 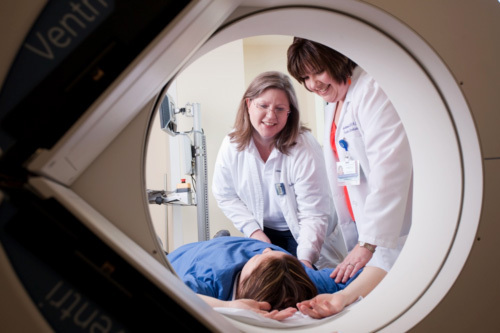 The Cedar Crest College Nuclear Medicine Technology major, which is offered as a joint program with the Pennsylvania College of Health Sciences (PA College) in Lancaster, PA —will provide you with all the tools you need for a rewarding career. Nuclear medicine technology involves the use of radioactive pharmaceuticals (also called radiopharmaceuticals) to diagnose and treat disease. Radiopharmaceuticals are radioactive substances that are attracted to specific organs, bones or tissues. The radiopharmaceuticals used in nuclear medicine emit energy in the form of gamma rays that are detected by a special camera: Gamma, SPECT, or PET. Computers convert the information collected by the camera into an image of the specific area of the body for an analysis of function, structure and function, or the characterizations of biological processes at the molecular and cellular levels. The field of nuclear medicine is unique in diagnostic technique because it provides information about both structure and function of almost every organ in the body. It is this ability to study function that separates nuclear medicine from other imaging modalities, such as an X-ray or magnetic resonance imaging. It’s a safe, painless and cost effective method of information gathering. The Cedar Crest nuclear medicine technology program leading to the B.S. degree is a partnership with PA College and through PA College is accredited by the Joint Review Committee on Educational Programs in Nuclear Medicine Technology (www.jrcnmt.org), which ensures that you will receive a quality education. By pursuing a bachelor’s degree in nuclear medicine technology at Cedar Crest College, you will work closely with experienced and well-respected professors. In the classroom and in the lab, you will obtain the latest knowledge and conduct relevant research using state-of-the art technology. As a future health care professional, you will enroll in nine credits of healthcare administration coursework with the highly recommended option of pursuing the Health Care Management Certificate. This certificate will provide both insight into the evolving field of health care and opportunities for advancement in health-care administration. You will also receive a quality liberal arts education, including instruction in the development of strong communication and leadership skills, that will enhance your personal and professional growth while enabling you to work effectively with other members of a health care team. You will spend your first three years studying on the Cedar Crest College campus; the fourth year consists of twelve months of clinical and didactic training. Three days per week are spent in clinical training at one of the affiliated hospitals of PA College and one day a week is spent in coursework at PA College. Due to the strength of these partnerships, you will have the opportunity to be trained in the clinical setting by physicians in combination with seasoned certified technologists and clinical coordinators in an integrated teaching and research environment. You will graduate with both a degree from Cedar Crest College in the Nuclear Medicine Technology major and a certificate in Nuclear Medicine Technology from PA College. More than 98 percent of our program graduates have passed certification examinations by the Nuclear Medicine Technology Certification Board (NMTCB) or the American Registry of Radiologic Technologists (ARRT) on the first try, with nearly one-third passing with honors. PA College has a 100% Nuclear Medicine Exam Pass Rate since 2004. St. Joseph’s Imaging Associates, Syracuse, N.Y.
St. Luke’s Hospital and Health Network, Allentown, Pa. The mission of the program is to educate students in preparation for a health career in Nuclear Medicine Technology and provide the health community with intelligent, competent , and compassionate technologists who understand the complexity of imaging systems protocols and modalities, radiopharmaceuticals and the performance of patient studies.